Brief ban lifted after 'guarantee' given that demonstrations would not descend into violence; minister denounces Jewish Defense League. 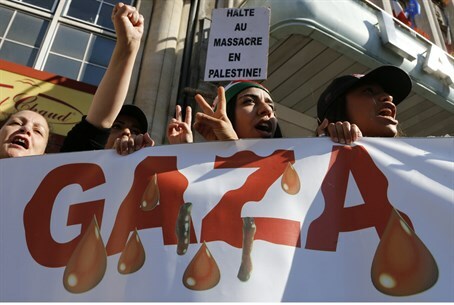 Several thousands of anti-Israel activists held a fresh protest against the Israeli operation in Gaza on Wednesday in Paris amid tight security, just days after similar rallies descended into violence and looting. The government, which had banned the prior protests seeking to restrain what it called "anti-Semitic radicals," authorized Wednesday's march after its organizers gave "security guarantees", Prime Minister Manuel Valls said Tuesday. A police source said more than 1,000 undercover and uniformed officers would be deployed along the march route, which ends in the upscale Invalides area where several government ministries are located. The marchers, many of whom held Palestinian Authority flags or stickers, shouted "Boycott Israel", as well as slogans such as "Israel killer" and "Long live Palestine, long live the resistance!". Samira Cheblal, a marcher, said she had come with a simple message: "Stop the massacre of children and civilians." President Francois Hollande issued a reminder to protesters that the "responsibility of the state, the government and the president is to ensure that order is respected." Interior Minister Bernard Cazeneuve meanwhile warned that anyone caught shouting "Death to the Jews!" or burning an Israeli flag during the marches would be arrested. But Cazeneuve also denounced the Jewish Defense League a militant Jewish self-defense group whose members clashed with hundreds of pro-Palestinian demonstrators in Paris recently, after the demonstrators attempted to attack a synagogue. Witnesses said that Jewish youths mobilized to fight back after police took a long time to arrived. Rallies took place in defiance of the ban over the weekend in Paris and its suburb town of Sarcelles, and ended in clashes, with police firing tear gas and arresting scores of protesters. In Sarcelles, several Jewish businesses were looted, prompting Roger Cukierman, the head of the country's main CRIF Jewish grouping, to voice fears of "pogroms." On Tuesday, four men were sentenced to between three and six months in prison for their role in the Sarcelles violence, and three others were given between three and five months suspended jail sentences for their involvement in the Paris unrest. The main organizer of Wednesday's protest, the National Collective for Just and Durable Peace between Israelis and Palestinians, hailed the decision to let the demonstration go ahead. "It's a victory for democracy and freedom of expression," said Taoufiq Tahani, president of the France-Palestine Solidarity Assocation that is part of the collective that called the rally. Another anti-Israel demonstration in Paris is planned for Saturday, and authorities have not yet said whether it will be allowed to proceed. The Israeli-Palestinian offensive has stirred up huge passions in France - home to the largest Muslim and Jewish communities in western Europe with around five million Muslims and half a million Jews. Valls, who was a tough-talking interior minister until his promotion this year in a cabinet reshuffle places him as prime minister, has blamed extremist groups for the violence last week. He told the Le Parisien daily certain unspecified "networks and extremist groups are trying to capitalize on this (Israeli offensive) by riding on sentiments of anti-Semitism and hatred" and using it "to foment disorder". Responding to Cukierman's comments over the risk of pogroms, Valls said there was "very big concern" among Jews in France, particularly after high-profile anti-Semitic attacks such as the May shooting in Brussels' Jewish Museum. The prime suspect in that attack is a French citizen and radical Islamist Mehdi Nemmouche. French political parties have broadly hailed the decision to authorize Wednesday's march. Four groups helping to organize the rally - the influential CGT union and three leftist parties - say that they will also be deploying people during the rally to ensure there is no violence. Anti-Semitism has become so commonplace in France that the Israeli government launched a special mass Aliyah program for the French Jewish community to cater for the growing exodus of Jews from the country; immigration to Israel from France has skyrocketed 312% in 2014.